Cystic disorders of the bile ducts, although rare, are well-defined malformations of the intrahepatic and/or extrahepatic biliary tree. These lesions are commonly referred to as choledochal cysts,which is a misnomer, as these cysts often extend beyond the common bile duct (choledochus). Cystic disorders of the bile ducts account for approximately 1% of all benign biliary disease. Also, biliary cysts are four times more common in females than males. The majority of patients (60%) with bile duct cysts are diagnosed in the first decade of life, and approxi-mately 20% are diagnosed in adulthood. 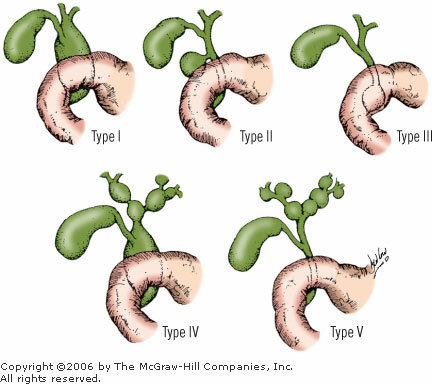 Cystic dilatation of the bile ducts occurs in various shapes—fusi-form, cystic, saccular, and so on—and in different locations through-out the biliary tree. The most commonly used classification is the Todani modification of the Alonso-Lej classification. The exact etiology of biliary cysts is unknown. The initial clinical presentation varies significantly between children and adults. In children, the most common symptoms are intermittent abdominal pain, nausea and vomiting, mild jaundice, and an abdom-inal mass. The classical triad of abdominal pain, jaundice, and a pal-pable abdominal mass associated with choledochal cyst is observed in only 10% to 15% of children, and it is rarely seen in adults. Symp-toms in adults often mimic those seen in patients with biliary tract disease or pancre-atitis. The definitive treatment of bile duct cysts usually includes surgical excision of the abnormal extrahepatic bile duct with biliary-enteric reconstruction. This approach relieves biliary obstruction, prevent-ing future episodes of cholangitis, stone formation, or biliary cirrho-sis and thus interrupting the inflammatory liver injury cycle. It also stops pancreatic juice reflux, and more importantly, it removes tissue at risk of malignant transformation.